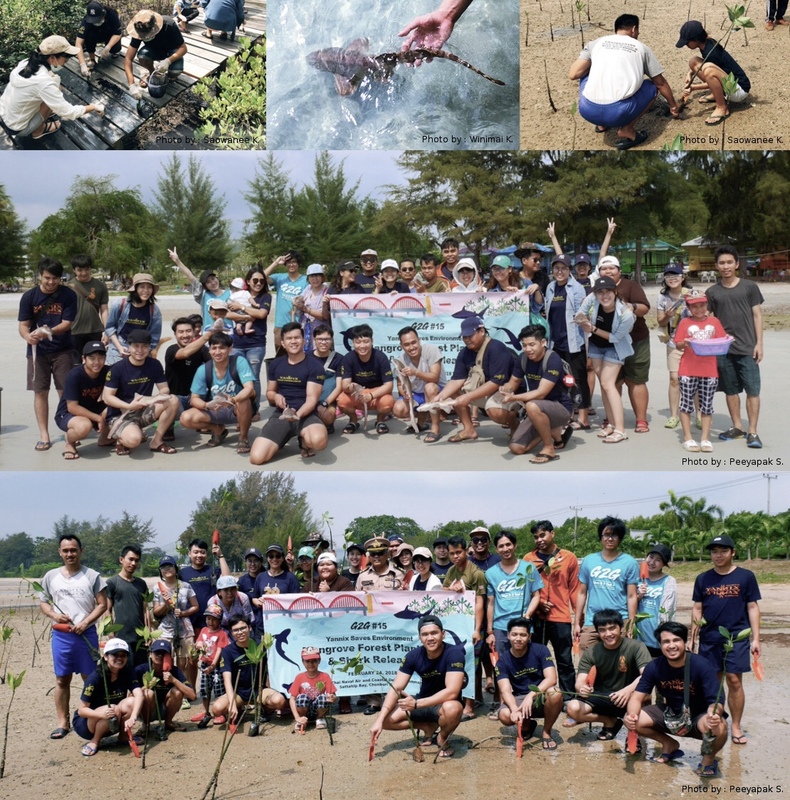 “Mangrove Planting & Shark Relocation/Preservation” (Give It 2 Get It #15) – Yannix(Thailand)Co.,Ltd. When Yannix volunteers arrived at the Royal Thai Naval Air and Coastal Defense Command at Sattahip Bay in Chonburi Province, they were welcomed by Lieutenant Commander Kridsada Yahirun (Deputy Chief of Air and Coastal Defend Command), and Chief Petty Officer First Class Somsak Rodsard, who served as their hosts as they kicked off a full-day of work and ecological education. Mangrove forests protect tropical coastal areas from erosion. The massive root system of the mangrove forest dissipates wave energy, and helps to slow tidal waters allowing roots to trap ocean sediment during the daily tidal cycle. This filtering effect of the mangrove forest plays a vital role in protecting seagrass beds and coral reefs from further damage. With this in mind, in the morning, Yannix volunteers were tasked with painting the walkways/bridge along the nature trail to protect them from infestation by termites and other insects that eat the wood. The next order of business in the morning was mangrove planting to help expand the mangrove forested area, which will provide a habitat for marine-life while helping to achieve a delicate balance with the forest ecology. In the afternoon, Yannix volunteers, under the direction of Chief Petty Officer First Class Thongchai Chookhanhom, moved operations to Nam Sai Beach (Nam Sai means clear water) where they released Brown-Banded Bamboo Sharks “home” — into the sea. As this spot is a Naval conservation area, the idea is that the shark population will grow and spread naturally without adversely affecting the local ecosystem. The sharks being introduced are considered to be non-aggressive. The sharks will remain local where they are expected to thrive, sustaining themselves by eating small fish. These sharks are considered suitable to release for conservation purposes. The efforts of the Yannix volunteers on this afternoon will help to increase the shark population without negatively impacting the overall ecosystem and the genetic diversity of sharks in this area. Ultimately, at the end of a day of hard work, Yannix volunteers learned a great deal about the marine ecosystem in general. Yannix thanks Lieutenant Commander Kridsada Yahirun (Deputy Chief of Air and Coastal Defend Command), Chief Petty Officer First Class Somsak Rodsard, and Chief Petty Officer First Class Thongchai Chookhanhom for sharing their time and expertise. It was a day those in attendance will not soon forget.